With the rains starting, the fish are migrating to the mouth of the Sooke River. Today saw a bunch of coho salmon jumping, with a dozen or so anglers on the beach, plus a kayak and stand up paddle board. 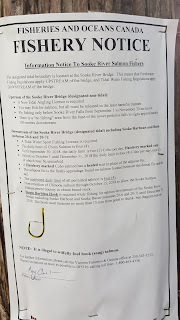 Above the bridge requires a fresh water license, is fly only, and zero retention allowed. 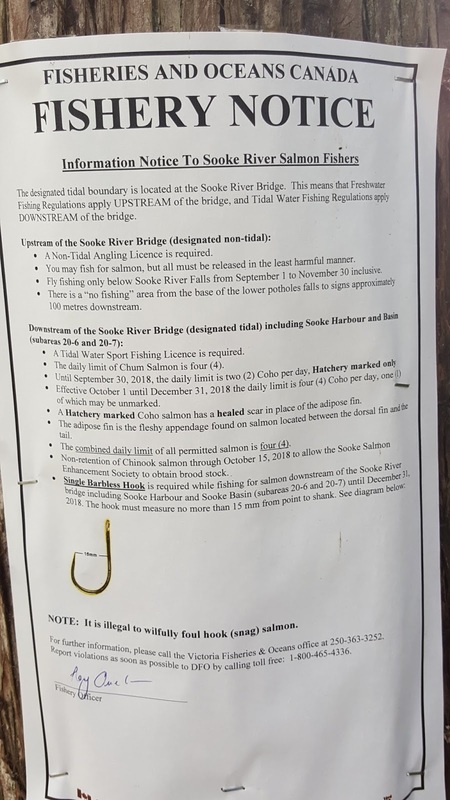 Below the bridge requires a salt water license. You can keep up to 4 salmon, of which one can be a hatchery marked coho (adipose fin removed). No retention of chinook, to give them a chance to breed. It is barbless single hook only, no trebles allowed -- and snagging is illegal, let's keep it sporting out there! Have fun and good fishing.